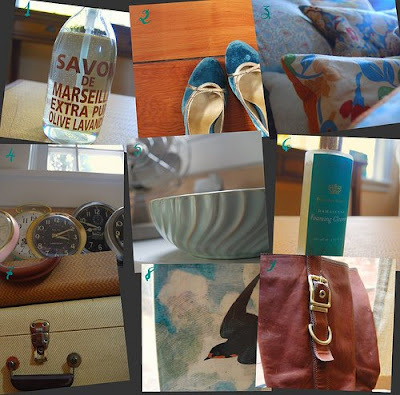 Her "I Heart Mondays" are wildly popular and filled with amazingly perfect finds every. single. week. And, she takes enormously lovely photos. Herewith, Mrs. French’s favorites. Have a great weekend! My Princess Shoes -- They are my favorite hue of blue and velvet. I don't wear them often, but often have them in plain site...they make me feel pretty and feminine. Enhabiten Pillows -- These pillows are made from the prettiest fabrics, including vintage inspired wools...they are filled with lavender and buckwheat...my B loves to sniff them as much as I do. Vintage Clocks -- I have a compulsion for vintage clocks; They look so dapper all in a row. My Blue Bowl -- This bowl was my very first vintage purchase. The perfect blue with a sweet ripple texture. Duchess Marden Damascena Foaming Cleanser -- this is my favorite facial cleanser...it makes my skin soft and smells fantastic! Vintage Suitcases as End Tables -- My friend Rebekah got me hooked on this...this set up also makes the perfect place to store B's toys or my photo orders, while not looking like the typical icky storage unit. John Derian Collection at Target -- I love John Derian and love the fact that he has teamed up with Target to make his perfect pieces more accessible for folks like me....Stephanie from Noun told me about this, and I have been on pins and needles since waiting for new pieces to be added. My Coach Boots -- I wear them all the time! They are ridiculously comfortable and so pretty too...the more I wear them the more I love them...they keep looking better. They don't sell this particular style anymore, but I am sure all their boots are equally comfortable. I love her blog- beautiful. Thanks for sharing! So fun to read - great list!! Mrs. French is a doll and i love her picks--thanks for sharing. I look forward to this feature every week. mrs. french has the most fabulous favorites. love it! Loving these favorites.. I am going to have to try the facial cleanser for the name alone - Duchess! How fabulous! Ok...first of all, I adore Mrs. French and her beautiful blog....secondly, I love this feature on Simplelovely, it is one of my absolute favorites! Thirdly...Mrs. French, those velvet shoes are to die for and I see why you adore them, the fact that you have those pillows makes me want to run out and buy one!, your clocks are sublime and I love that you collect them, that bowl and facial cleanser are calling to me....I agree with you about that John Derian platter, I have it too and it is so wonderful, sweet and surprisingly solid! and those boots....well, you KNOW how I feel about the shoes and boots you pick! No one does it better! Noone! traci's i heart mondays are so cool that i knew her favorites were not going to disappoint. lovely, just like her! i found you from mrs frenchs blog, and now i have another one to enjoy! we share the same taste, great picks! Love the John Derian line too...esp. that long necklace with the pretty clear quartz. ooh! let her do it again, jos! Lovely feature about a lovely person - thank you!! I tagged you SEE MY BLOG!!!!!!!! Hope you will participate. gorgeous! she has an incredible eye! and i heart her seven days a week! !